With just one month left before the vote that analysts fear could reignite war in Sudan, activists across the country are calling on U.S. and world leaders to do everything possible to help forge a path to peace in Sudan. 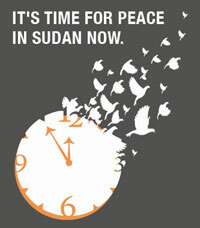 To find out where the events are, or how to host one, go to Save Darfur’s special Week of Action page. One banner event that everyone can participate in is a live town hall meeting with Darfuri refugees in eastern Chad. At 10 a.m. EDT on Sunday, December 12, iAct is facilitating the interactive event, hosted at iactivism.org/live. Participants can ask questions through Twitter and the website. Sudan Now has also set up a petition to President Obama laying out the key asks from the Sudan advocacy community to his administration in the coming month. To read the five asks and add your signature, click here.